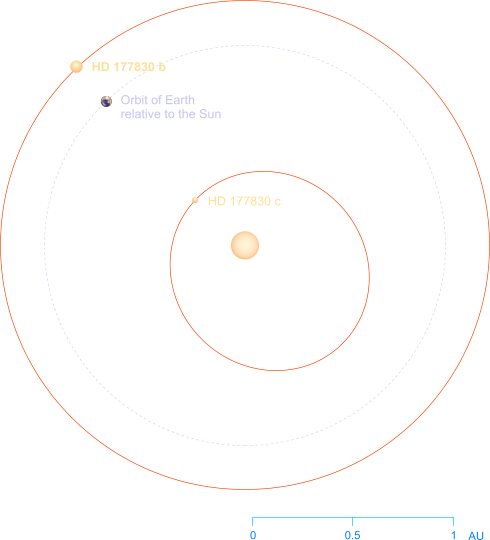 The orbit of HD 177830 b around its parent star, HD 177830 A. Also shown is the orbit of its inner companion planet HD 177830 c, and the orbit of the Earth around the Sun for comparison. Bodies shown here are not to scale. The other star in this binary system, HD 177830 B, is a red dwarf circling the 'A' star at a distance of at least 100 AU (or about fifty times the diameter of this chart). One of a binary pair making up the HD 177830 system about 192 light years from the Solar System, HD 177830 A is an orange-red star, more luminous and more massive than the Sun. HD 177830 b is a gas giant planet that orbits this star at a distance of some 1.2 AU (if it were within the Solar System, it would lie beyond the orbit of Earth, but well within that of Mars). This massive planet - about 50% more massive than Jupiter - takes more than four hundred days to complete its orbit. More than ten years after the discovery of HD 177830 b, another planet was discovered within the same system, orbiting much closer to its parent star. HD 177830 c, as it is known, is a much smaller body, with only about a tenth of the mass of the 'b' planet. The orbits of the two planets appear to be locked: for every single orbit made by HD 177830 b, its smaller companion HD 177830 c travels around its orange star four times.